Freezing milk when it’s on sale is a common practice for budget savy shoppers. Where I live milk is about $5.50 a gallon and I haven’t seen it on sale ever. Those of you in the US might be luckier, maybe even other parts of Canada, but my local grocery stores would rather sell out of milk than mark it down or put it on sale. So knowing how much I use if I ever found a good sale I’d stock up as much as I had space for in my freezer. But, you probably want some answers before you start stocking the freezer shelves right? Lets get started. 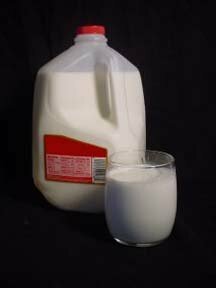 Does freezing milk cause it to change? Back in the days when milk was delivered to your doorstep in glass jars during winter the milk often froze. No one questioned it then but today people are afraid to freeze milk. The nutrients stay the same but when freezing milk the fat does separate, a process sometimes called reverse homogenization, thus the ‘mouth feel’ of the milk can be different. That is why some people don’t like it. Shaking thawed milk before each use helps to blend the fat back into the milk. Even if you don’t like the ‘mouth feel’ frozen milk is still fine to use for cooking and baking. Do not freeze milk after the ‘best before’ date. Ideally you should start freezing milk as soon as you get home from the grocery store. Does frozen milk look different? Freezing milk makes it turn yellowish, because of the fat separating. However, once it thaws milk will return to it’s normal color. Is freezing milk in the plastic container it comes from the store in OK? Yes, however, freezing milk causes it to expand. Many of the plastic milk containers in the grocery store are somewhat flexible. That gives the frozen milk room to for expansion. Some containers don’t have enough room though. If your plastic milk container has indents in the sides that can push out when the milk freezes it should be fine. If the milk container is flat however you should open the milk and pour out about 1 cup then recap the milk and freeze immediately. How long can I store frozen milk? Freeze milk for up to 3 months. Frozen milk is not going to spoil so it’s possible to freeze it even longer. However milk can easily absorb other flavors in the freezer. Store at 0F or lower. What temperature should I freeze milk at? Freeze and store milk at 0F or lower. How can I thaw frozen milk? The best method is to thaw the milk in the fridge. This can take 2-3 days. Milk can be thawed in the sink in cold water to speed up the process. Do not use hot water, or any other source of heat unless the milk is going to be cooked immediately. Many people thaw milk on the counter but I don’t recommend this. It’s too easy to leave it there too long and milk at room temperature spoils quickly. How long is thawed milk good for? Generally 5-7 days. But that varies based on how cold your fridge is and how cold the milk was kept while thawing. Also freezing does not reverse spoilage, if the milk was not fresh when it was frozen it will go bad faster when thawed. Can I freeze Egg Nog? Yes, freeze egg nog for up to 2 months as long as it goes into the freezer before the ‘best by’ date. Shake thawed egg nog well just like milk. Can Soy and Rice Milk be Frozen? Yes, however, many unopened varieties of soy and rice milk are stored at room temperature. Thus, in my humble opinion, they are not worth the freezer space. Your grocery store probably keeps rice and soy milk in the fridge so it is cold, the way people prefer to drink milk and because the fridge is a logical place for shoppers to look for milk type products. If it doesn’t say it must be kept cold leave it in the pantry. After the container is opened however, if you can’t use it all before it goes bad, by all means, freeze it. Return from Freezing Milk to the homepage of Favorite Freezer Foods.